Discover Why GRATITUDE Has The Power To Shift Your Experience To One Of Freedom, Happiness And Joy (No Matter What‘s Going On In Your Life)! You Are About To Learn Exactly How To Access The Life-Changing, Energy-Shifting Power Of Gratitude And Properly Structured Affirmations In A Tangible, Practical And Achievable Way! Welcome! I am delighted that you’ve arrived here! Do you struggle with feeling happy, optimistic and grateful as a regular way of being? Do negative thoughts, people and situations have too much power over you? Are you not sure exactly how to create the life you desire? If you answered “yes” to any or all of the above, you are not alone! In fact, 95% of people face these exact same experiences and it remains one of the biggest factors as to why they fail to achieve the success and happiness in life they are seeking. I want you to have the necessary tools to interrupt those old patterns and lay a new foundation that will chart a new course for your successful future! I have created the life of my dreams using these very principles and we absolutely know it is possible for anyone, including you! 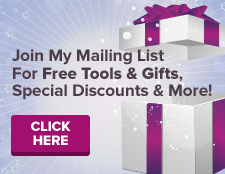 I would like to welcome you to this life-changing opportunity to Shift YOUR LIFE With The Powerful Energy of Gratitude, Affirmations and Daily Action! Learn how to notice and feel gratitude for everything in your life? Utilize daily practices to move out of negativity, stagnation and blocks that are holding you back from the life you want and deserve? Begin designing and creating your life exactly as you want it to be (without your past having any power over how you choose to plan your future)? Discover why properly created affirmations are much more powerful than most people realize? Learn exactly how to structure your affirmations for maximum potency in declaring and creating your future? Be able to track the tangible, measurable steps you’ve taken toward your fantastic future? Feel more grateful and hopeful about your life exactly as it is right now (as well as feeling inspired by the magnificent future you are designing)? If you’ve answered yes to any or all of the above, then please keep reading. 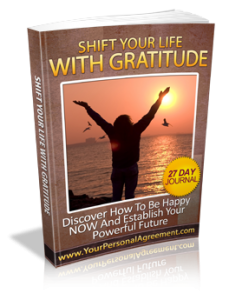 I want to show you exactly how to shift your energy to one of deep gratitude for your current life (as well as your past). I will also teach you how to experience inner happiness and excitement about your future –– a future you will actively declare and design on a daily basis during this course (and beyond)! Gratitude For The Things We Can Be Grateful About Right Now Is One Of The Biggest Keys To Bringing Into Our Experience The Things We Want (And Will Be Grateful For When They Arrive). For this reason, it’s truly important to find as many ways as possible to experience gratitude right now and often throughout each day (no matter what your life currently looks like). When you combine the power of gratitude with carefully crafted affirmations and consistent daily action, you have a commanding formula for creating a magnificent life! This powerful combination of tools is one of the absolute fastest ways to feel great RIGHT NOW and achieve the future you deserve! The Lives Of Their Dreams! Here’s Your Chance To Join Them! Designed as a hands-on, practical journal, this course is actually much more than any gratitude journal you may be familiar with. This journal is a 3-step daily guided action plan to quickly align you with the cherished life you wish to have! It is also infused with extra energetic assistance from powerful Feng Shui principles. Practice noticing and feeling gratitude for all the things that are currently in your life (that you may have been taking for granted). You will also work with very powerfully structured affirmations to declare and design your future life exactly as you wish it to be. Then… you will go out into your days equipped with several tools to keep your energy in alignment with gratitude, happiness and the fantastic future you are actively creating! This course implements powerful daily practices but it was purposely designed to require only about 10 minutes of your time per day so you are set up to WIN with these tools! Sign up for this course and immerse yourself in the life changing energy of gratitude, affirmations and daily action for the next 27 days. Once you have a complete understanding of exactly how to use these tools, you can use them for the rest of your life! 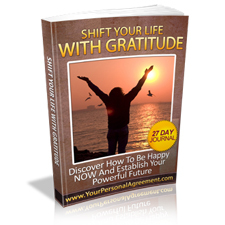 Immerse yourself in the life changing energy of gratitude, affirmations and daily action for the next 27 days. This powerful combination of tools is one of the absolute fastest ways to change your life! I have taken great care in assembling the tools that I know from personal experience will set you on a course to achieving the things in life you are seeking. I hope you will take this opportunity to start shifting your life! P.S. Please don’t take my word for it – I am far more interested in you hearing from others what these tools have done for them because at the end of the day – it’s the tangible results that matter. I will always honor and respect your right to expect nothing less from me!